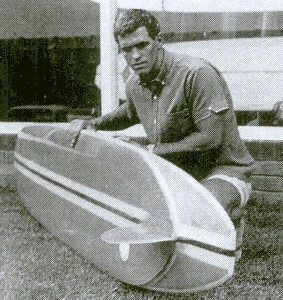 1964 King Step Tail 9 ft 6"
Foam blank, 3/8 stringer on bottom, wedge stringer on deck - 1" at nose, 2" at tail. The two outer laminates must be inlays. Rails: Round fat 50/50 to tapered 50/50 in tail . Original fin missing , replaced by 1970's Bahne Box. 10 1/2" base 9" high. Set at the tail step. Deck: King Surfboards with address and phone number,.Black and yellow in rectangle with crown grahic at tail. Bottom: King Surfboards with address and phone number,.Black and yellow in rectangle with crown grahic. Forward of fin. 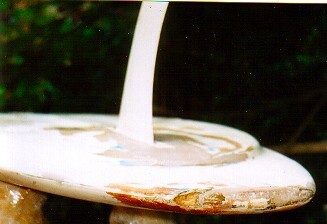 Damaged by the added fin box and covered in restoration. Collected by Daniel Bond from local NSW Central Coast markets,in 2002, cost $200. The board was in poor condition and covered with non-original white paint.. Original fin missing , replaced by 1970's Bahne-type fin-box (Multifins?) and plastic fin. See pre- and post- restoration photographs below. The condition of this board prior to restoration, on a scale of 1-10 would have been 2-21/2. The board was white all over. Probably not original because it covered the manufactures logo and the foam was quiet brown. It had major dings on the tail and nose, stress marks on the bottom, and fractures and dings all around the rails. The board was in such a poor condition there was no choice but to do a full pigment job. All the pigment / gelcoat was sanded off revealing the "King " logo and the wedge stringer on the deck. The fin box had to be removed and the step area rebuilt. The rails had to be faired and glassed, stress marks and dings repaired, and a new fin glassed in. Pigment coats applied, pin lined, wet & dry sanded and polished. See bottom of page for post-restoration photographs. 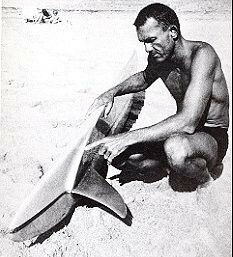 The Step tail design is credited to John Kelly of Hawaii, circa 1962, and detailed in his excellent book, Surf and Sea, pages 139 to144. Some diagrams, images and text are reproduced below. Apart from any performance benefits of the design, it is noteable for the early use of dropped rails and a breakaway edge in the tail. 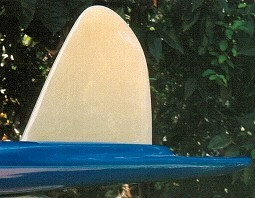 The high aspect fin, and it's forward positioning, is also an advanced design for 1962. He applied for and was granted US patents for the design - # 3111695 and # 3160897. John Kelly was credited, along with Fran Heath and Wally Froiseth, with the first narrow tail template in 1934. This finless design became known as a Hot Curl, and developed to include a deep round or vee bottom in the tail. 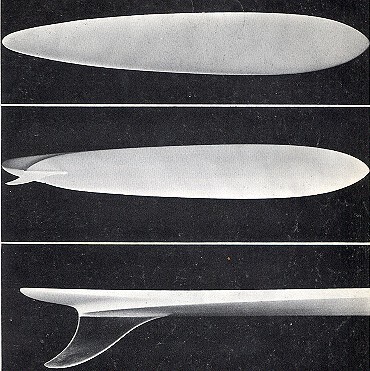 It was the first major variation in template and/or bottom design since the revival of surfing in the 1900's. John Kelly's account of the Hot Curl is in Surf and Sea, pages 108 to113. 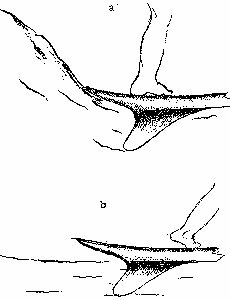 The stepped tail feature was reprised by Ben Apia in his Stinger design, 1974, and was also used on some kneeboards in the late 1970's.. The deck contour harmonizes requirements of speed and sharp sliding angle. semi-dropped rails amidship and fully dropped rails aft combine speed with high-riding capability on steep walls. the axis of the skeg is angled to correspond to the pivotal axis during twistoffs. b) lean forward, tail is airborne producing minimum drag for high speed." Margan and Finney, page 227. 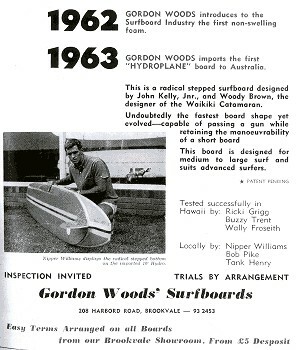 The photgraph of John kelly, above, accompanied an Advertisment for Gordon Woods Surfboards, in a Surfing World - Surfabout magazine advertisment, circa 1964. - Attested by R. Grigg and Wally Froiseth. - Tested Wednesday 6th Feruary (??) in 15 ft Long Reef by Nipper Williams. imported into Australia by Gordon Woods. the board appears remarkably similar to # 190. Vol 1 No 4, page 3. Volume 1 Number 3 page 17. A rare example of this design. A case of an Australian manufacturer building an overseas design, possibly based on a photograph and probably without a credit to John Kelly. Restoration, photographs, notes and dimensions contributed by David Platt. Many thanks for the contibution and congratulations on the restoration to David. Kelly, John : Surf and Sea, pages 139 to144.